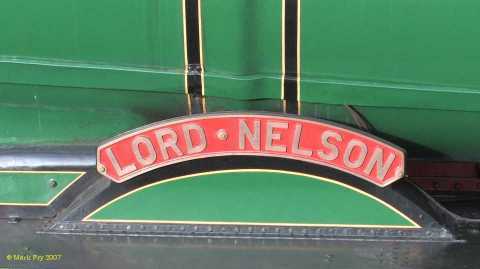 R. E. L. Maunsell designed the Lord Nelson class 4-6-0 locomotives to haul 500 ton trains, such as The Golden Arrow and The Bournemouth Belle, at an average speed of 55 mph, yet keep within the Southern Railway’s 21 ton axle-weight limit. When no. 850 Lord Nelson was introduced in August 1926, it was the most powerful passenger locomotive in Britain with a tractive effort of 33,510 lb, a fact which the Southern Railway publicity department made much of. The story goes that this irritated the Great Western Railway board so much that they commissioned Collet to build his King class. On the other hand, Fowler at the LMS was so impressed that he asked for copies of the blue-prints. 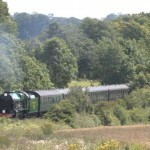 Maunsell, flattered, obliged and the result was the Royal Scot class. 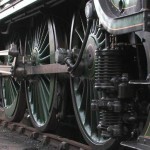 Perhaps the most distinctive feature of Lord Nelson’s design is the arrangement of the crank axle: the cranks are set at 135 degrees so that the four cylinders produce eight “beats” per revolution. (The more usual arrangement is to set the cranks at 90 degrees to give 4 beats per revolution.) This arrangement gives a much more even draft over the fire, reduces stresses in axleboxes and the motion generally and, most importantly, reduces hammer-blow to a minimum and hence does less damage to track and bridges. 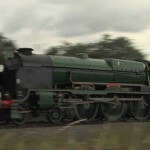 When combined with the multi-jet blastpipe and wide chimney fitted by Bulleid, the 8-beat arrangement makes Lord Nelson a remarkably quiet engine, when compared to her GWR and LMS peers. Do not be deceived into thinking that she is weak because of this! 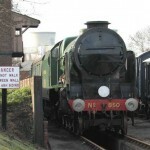 850 is more than a match for a Castle, a Royal Scot or even a Princess! All 16 members of the class were withdrawn during 1961 and 62, and all but one, class pioneer 850 Lord Nelson, were scrapped. 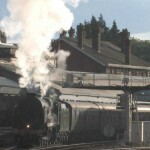 850 joined the National Collection and eventually found her way to Steamtown, Carnforth. She returned to steam in May 1980, just in time to take part in the Rocket 150 Cavalcade at Rainhill. In the following years, she worked many mainline tours in the north of England and over the Welsh Marches route. 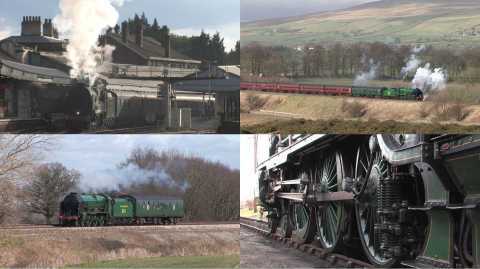 Writing in 1983, Townroe describes how she had “cheerfully taken 500 ton trains over the Settle & Carlisle line” and “earned itself an excellent reputation”. 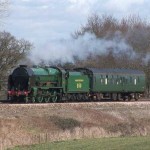 However, as repairs became needed and Steamtown changed from a tourist attraction to a railway maintenance works, 850 was put to one side and largely forgotten about until the Eastleigh Railway Preservation Society approached the National Railway Museum with a proposal to restore her for main line work. The full story of that restoration is told by ERPS member Brian Southon on another DVD. Details are available from the ERPS. In August 2006, 80 years after she was built, and a few weeks after she was renamed by HRH The Princess Royal, 850 left Eastleigh Works in light steam, towed by an EWS diesel, bound for the West Somerset Railway for running-in and a staring role at their Autumn Steam Gala. 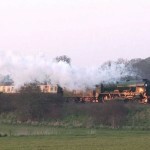 At the end of the year, she moved the the East Lancs Railway in preparation for a main line test run, which finally happened on March 7th 2007 (after another Steam Gala appearance, at the ELR). 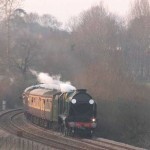 Her first public main line tour was “The Trafalgar Express” from Minehead to Eastleigh on 31st March. On July 8th she worked The Southern Sunset from Waterloo to Salisbury, Honiton, Exeter and Bristol, returning via Salisbury. Sadly, a partly collapsed brick-arch in the firebox lead to long delays at Exeter and eventual withdrawal at Westbury, but not before she had posted exceptional performances climbing Honiton and Whiteball banks. She was repaired in time for her next tour to Folkestone Harbour at the end of the month. 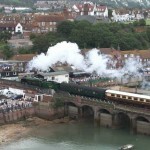 Her 11th main line tour of the year, to Weymouth on 15th Aug., was to be her last (for the time being). Firebox problems were found during a routine inspection the next day and she was withdrawn for repairs. At the end of October she was moved by road from Old Oak Common to the NRM at York, and work commenced at the end of November to strip the boiler for a thorough inspection. Since then she has moved to the Mid Hants Railway where, following a series of repairs, she is again a reliable performer. This programme is a joint effort with TWR Video and David Ainsworth (“Linesider“). Shot on an older camera, hence the extra black bars either side of the image. West Somerset Railway, Autumn Steam Gala. Lord Nelson’s first public runs were on the WSR. After some gentle running-in turns, she was the star of the autumn gala. 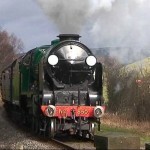 East Lancs Railway, Winter Gala. 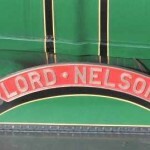 Whilst waiting for her test run, Lord Nelson was a welcome guest on the ELR. Main line test run. Carnforth-Hellfield-Preston-Carnforth. After several postponements, 850 finally got to stretch her legs on the main line. The test run was a success. An unexpected stop-over at the Great Western Society’s home after her light engine move from Lancashire ran very late and the loco crew went over their hours. With a fresh crew, 850 finally completed her journey from Bury to Minehead. 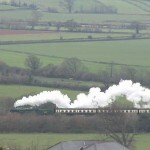 West Somerset Railway, Spring Steam Gala. Doing what she was built for, for the first time in a generation, 850 hauled her first public train on the mainline. 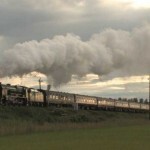 The Cathedrals Express: Victoria-Salisbury-Bristol and return. 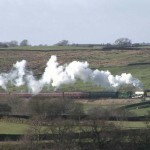 Several of 850’s tours were picked up unexpectedly after 777 Sir Lamiel suffered firebox problems. 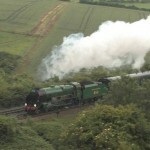 The Cathedrals Express: Victoria-Salisbury-Yeovil Jc, Weymouth-Yeovil PM-Westbury, Salisbury Tunnel Jc-Victoria. Clearance problems with the A30 bridge east of Sherborne forced a late change of route with two changes of direction, at Westbury and Lavistock. The Bath & Bristol: Haywards Heath-Hove-Salisbury-Bristol and return. Much of the spring and early summer was blighted by wet weather. On this day our cameraman was lucky to dodge the heavy showers to see our hero in the sun five times. 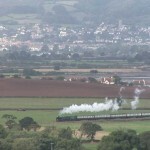 Unusually, this week’s Cathedrals Express was routed via the Great Western main line on its return from Bristol. The Southern Sunset: Waterloo-Wimbledon-Salisbury-Honiton-Exeter-Bristol-Salisbury-Clapham Jc. 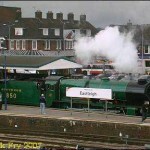 40 years after the end of steam on the Southern Region, 850 was in charge of an ambitious Anniversary tour. Sadly, a part-collapsed brick arch caused long delays and eventual failure at Westbury. The Golden Arrow: Battersea-Tonbridge-Ashford-Folkestone East, Folkestone Harbour-Folkestone East (twice), Ashford-Canterbury W-Minster-Dover-Ashford-Tonbridge-Battersea. Our cameraman talked his way onto a balcony of the hotel overlooking Folkestone Harbour. 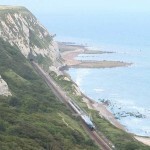 The Cathedrals Express: London-Bournemouth-Weymouth and return. On a windy summer evening, we get our last view, for the time being, of Lord Nelson doing her day job. Two days later, she was withdrawn from what should have been her first VSOE charter, following the discovery of firebox problems.